Low birthweight causes many health challenges for newborns in the days and months after their birth and serves as a strong predictor for future health issues such as developmental problems, cardiovascular disease, and respiratory conditions. Low birth weight is also an indicator of the health of the mother during pregnancy and of the accessibility of maternal health resources. A child is categorized as having a low birth weight if the weight at birth is less than 2,500 grams. Louisville currently ranks 10th among its peer cities on this metric, with 9% of infants being born at a low birthweight. 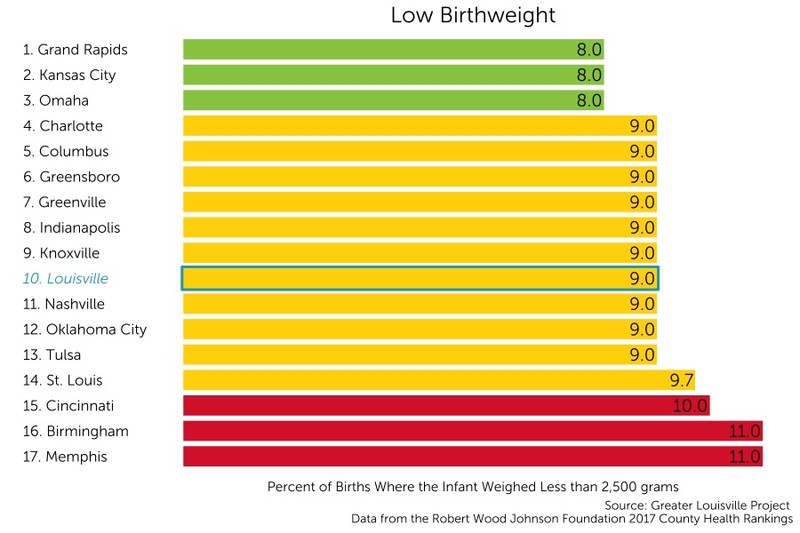 Louisville is in the middle tier of its peer group low birth weight rates according to a natural breaks algorithm. Cities in green are those that outperform their peers, cities in yellow represent the middle cluster, and those in red are a group that lags behind its peers on this indicator.